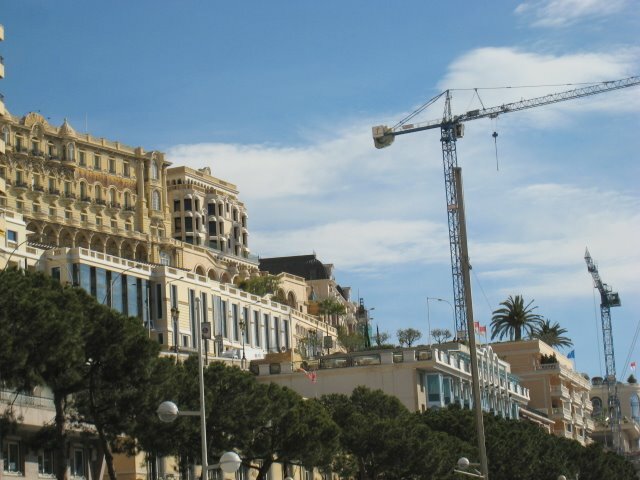 This is a typical scene in Monaco - building cranes everywhere. Work never seems to stop in what is, after all, a tiny place. The rather beautiful building you see top left is the Hôtel Hermitage - many consider this hotel to be superior to the famous Hôtel de Paris. One of the smaller bars of the Hermitage was converted from what used to be Maria Callas' dressing room! Are they restoring old buildings or building new ones? Although I cannot imagine the latter - I thought every inch of land in Monaco was already developed! I've never seen the Hermitage from this angle. It is lovely, not sure it's superior to the Hotel de Paris though. Jilly, how much is a night at the Hotel Hermitage? Mahalo for letting me know the best place to stay!